Which Chinese language is this? So these are the low numerals and the days of the week. A quick check suggests to me that these resemble Hakka more than they do Cantonese. They’re definitely not Mandarin. And I suspect their phonetics reflect an older stage of the language in question. Anyone want to figure out which Chinese language (“dialect”) these reflect? 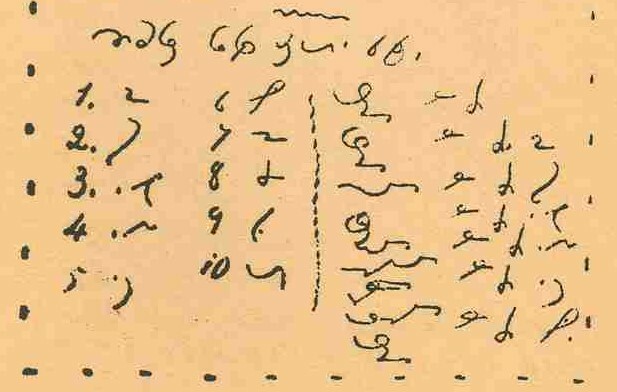 There is an anecdote from Father Le Jeune in a later issue of Kamloops Wawa about how he was in a local store operated by a Chinese immigrant, and wrote down some Chinese words in Chinuk pipa shorthand. Some “Indian boys” amazed the shopkeeper by reading them “perfectly”. Maybe these were those words! https://www.youtube.com/watch?v=0uvQiR8Fqgg or on YouTube under Learning Taishanese Part One. It is interesting that ToiSan/TaiShan has the lateral fricative of the original Chinook which Pere Lejeune tried to write with an hl. Toi San is closely related to Cantonese which I believe is also called the Sam Yap(Three County) area. This is the language spoken in Hong Kong. This Cantonese supplanted Toi San as the language of overseas Chinese in British Columbia in the 1970s with increased immigration from Hong Kong. Lat bai means 禮拜, pronounced libai in Mandarin, meaning week or weekday (literally, ritual worship, referring to Sunday as the cycle initial.). Pretty nifty to see this in the KW! Your valuable observations are appreciated, Sant’owax and Sam! I was especially interested in that “hl” and “hn” — voiceless eh? I haven’t dared to look for Chinese immigrant documents in the PNW. But I would wager there must be some in e.g. the Provincial Archives of BC (Victoria), Chinese historical associations’ collections, UW archives, Washington State’s collections, and so on. I steadfastly encourage anyone equipped with a reading knowledge of Chinese to take that search on as a significant project that *may* reveal quite a bit about language contact as seen from the Chinese viewpoint. We know that Chinese Pidgin English was written in Chinese characters in handbooks published in the old country — so it’s not unlikely that some of it was documented that way in immigrants’ letters or journals. And if someone discovered Chinook Jargon written in characters, it would be a marvelous contribution. I would love to do some serious on-the-ground investigation on this, really, so appreciate your pointers. (Currently filed under “someday”.) I recall your post on the Asian Pacific Pidgin in characters. Did I mention to you that until very recently they still printed such transcription glossaries to English in the yearly “tongsheng” almanacs? What is fascinating to me, and tricky on several levels, are the various customary usages of such transcription, even standards, which shift across time and dialect. (That is, there are dedicated characters used for such transcription.). I’m most familiar with Sino-Sanskrit, which informs a lot of the old timey Cantonese transcription. I’d reckon this would have been via the Buddhist-Daoist popular breviaries and “good book” morality texts which would have been widespread back in the day. (Though I’ve never yet seen a history explicitly tracing that link.). So if there is a Sino-Chinukwawa script, it will probably be of that ilk – Toisanese Sino-Sanskrit. If you come across such devotional texts, perhaps if LeJeune and crew did a canny Christian deployment of the genre as Chinese evangelism, for instance, please tender me a head’s up!